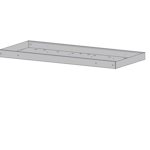 Feather-Lite shelf units are built with extruded aluminum support rails, strong, impact resistant fiberglass reinforced (top and bottom) polypropylene honeycomb shelves and flanged aluminum sides included rubber shelf mats keep your tools and supplies from sliding around. Loading up a work van can be tricky and hazardous, especially if you have a lot of tools, tanks, and other supplies. Organization and safety are key, and the van shelving from Kargo Master specializes in making your commercial van a more efficient workspace. 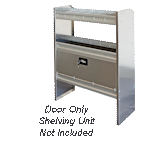 The shelving comes in three widths to meet your needs, including 42 inch, 74 inch, and 84 inch. 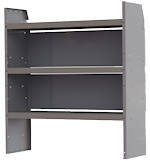 The units are all welded for durability and stability; in fact, some shelves are themselves welded to the end panels to increase strength and reduce rattling. Other shelves rest on half-shear buttons to keep them locked in place. 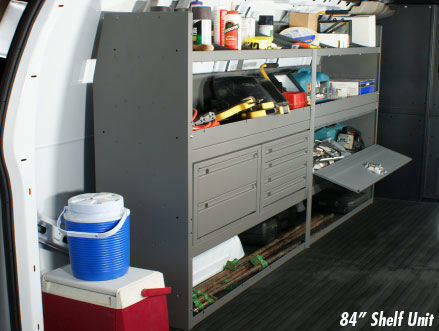 Shelf doors create a closed unit to keep equipment from falling out when driving down the road. Each unit is coated in a hard scratch and chip resistant powder coating to withstand the beating such shelving is bound to take from tools and equipment being loaded onto them. The units are also contoured so that they sit flush against the roof of a curved van, which in turn keeps them from toppling over. The best part is that, because these shelves are sold as a unit, no assembly is required, saving you time and energy. 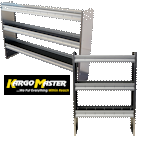 Kargo Master van shelving are easy to install and will keep your commercial van organized, well-stocked, and safe. No more sorting through piles of equipment to find that one tool. No more running out of an item that you thought was already in the van. And no more loose items rolling about and causing distractions. Just a well-equipped, ready to roll, work van.